Almost a year ago, we wrote a first post about our efforts to build virtual networks that span both virtual and physical resources. As we’ve moved beyond the first proofs of concept to customer trials for our combined solution, this post serves to provide an update on where we see the interaction between virtual and physical worlds heading. terminating the overlay on physical devices, such as top-of-rack switches, routers, appliances, etc. managing interactions between the overlay and the physical devices that provide the underlay. The latter topic is something we’ve addressed in some other recent posts (here, here and here) — in this blog we’ll focus more on how we deal with physical devices at the edge of the overlay. So, the first thing we added to the solution space once we got L2 working was L3. By the time we published the VTEP schema as part of Open vSwitch in late 2013, distributed logical routing was included. (We use the term VTEP – VXLAN tunnel end-point – as a general term for the devices that terminate the overlay.) Let’s take a look at how logical routing works. 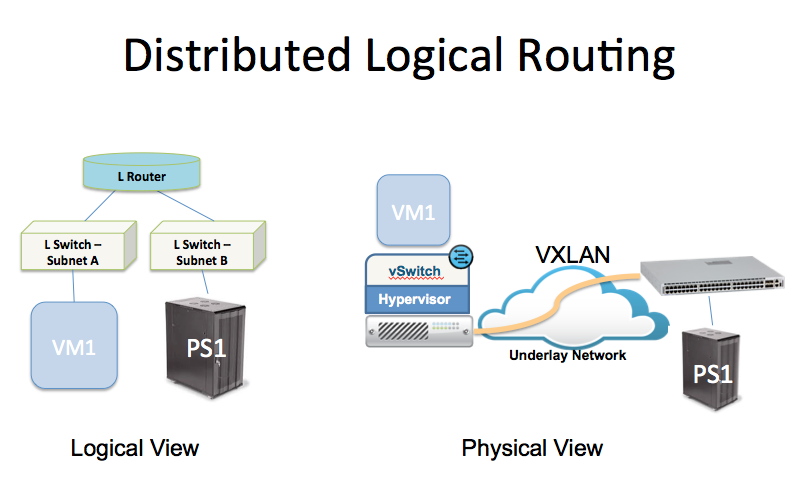 Distributed logical routing is an example of a more general capability in network virtualization, the distribution of services. Brad Hedlund wrote some time ago about the value of distributing services among hypervisors. The same basic arguments apply when there are VTEPs in the picture — you want to distribute functions, like logical routing, so that packets always follow the shortest path without hair-pinning, and so that the capacity to perform that function scales out as you add more devices, be they hypervisors or physical switches. So, suppose a VM (VM1) is placed in logical subnet A, and a physical server (PS1) that is in subnet B is located behind a ToR switch acting as a VTEP (see picture). Say we want to create a logical network that interconnects these two subnets. The logical topology is created by API requests to the network virtualization controller, which in turn programs the vswitches and the ToR to instantiate the desired topology. Part of this process entails mapping physical ports to the logical topology via API requests. Everything the ToR needs to know to participate in the logical topology is provided to it via OVSDB. Suppose VM1 needs to send a packet to PS1. The VM will send an ARP request towards its default gateway, which is implemented in a distributed manner. (We assume the VM learned its default gateway via some prior step; for example, DHCP may be used.) The ARP request will be intercepted by the local vswitch on the hypervisor. Acting as the logical router, the vswitch will reply to the ARP, so that the VM can now send the packet towards the router. All of this happens without any packet leaving the hypervisor. The logical router now needs to ARP for the destination — PS1 (assuming an ARP cache miss for the first packet). It will broadcast the ARP request by sending it over a VXLAN tunnel to the VTEP (and potentially to other VTEPs as well, if there are more VTEPs that are involved in logical subnet B). When the ARP packet reaches the ToR, it is sent out on one or more physical interfaces — the set of interfaces that were previously mapped to this logical subnet via API requests. The ARP will reach PS1, which replies; the ToR forwards the reply over a VXLAN tunnel to the vswitch that issued the request, and now it’s able to forward the data traffic to the ToR which decapsulates the packet and delivers it to PS1. For traffic flowing the other way, the role of logical router would be played by the physical VTEP rather than the vswitch. This is the nature of distributed routing — there is no single box performing all the work for a single logical router, but rather a collection of devices. And in this case, the work is distributed among both hardware VTEPs and vswitches. We’ve glossed over a couple of details here, but one detail that’s worth noting is that, for traffic heading in the physical-to-virtual direction, the hardware device needs to perform an L3 lookup followed by VXLAN encapsulation. There has been some uncertainty regarding the capabilities of various switching chips to perform this operation (see this post, for example, which tries to determine the capabilities of Trident 2 based on switch vendor information). We’ve actually connected VMware’s NSX controller to ToR switches using at least four different classes of switching silicon (two merchant vendors, two custom ASIC-based designs). This includes both Arista’s 7150 series and 7050X switches. All of these are capable of performing the necessary L3+VXLAN operations. We’ll let the switch vendors speak for themselves regarding product specifics, but we’re essentially viewing this as a non-issue. OK, that’s L3. What next? Overall, our approach has been to try to provide the same capabilities to virtual ports and physical ports, as much as that is possible. Of course, there is some inherent conflict here: hardware-based end-points tend to excel at throughput and density, while software-based end-points give us the greatest flexibility to deliver new features. Also, given our rich partner ecosystem with many hardware players, it’s not always going to be feasible to expose the unique features of a specific hardware product through the northbound API of NSX. But we certainly see value in being able to do more on physical ports: for example, we should be able to create access control lists on physical ports under API control. Similarly, we’d like to be able to control QoS policy at the physical ingress, e.g. remarking DSCP bits or trusting the value received and copying to the outer VXLAN header. More stateful services, such as firewalling or load-balancing, may not make sense in a ToR-class device but could be implemented in specific appliances suited for those tasks, and could still be integrated into virtualized networks using the same principles that we’ve applied to L2 and L3 functions. In summary, we see the physical edges of virtual networks as a critical part of the overall network virtualization story. And of course we consider it important that we have a range of vendors whose devices can be integrated into the virtual overlay. It’s been great to see the ecosystem develop around this ability to tie the physical and the virtual together, and we see a lot of opportunity to build on the foundation we’ve established. This is a pretty cool concept. I never considered the impact of extending a Layer 3 device such as a router across both physical and virtual devices. The concept of a virtual router in a pure virtual infrastructure makes sense. It’s relatively simple to create a distributed router across hypervisors but creating a distributed router across physical and virtual constructs creates problems such as the ARP example given. Having a physical switch with the capability to participate in distributed layer 3 devices hurts my head a little but the ARP example is a great primer. Keith – Happy to answer any questions you may have on the topic, as I am sure so is Brad, let me know would love to not only answer questions but get some advice from your experiences…. It’s an interesting concept (virtual and physical L3 devices), but I’m not sure you would really see this deployed much. More than likely you’re looking maybe some lab/dev environments, small providers/companies, or maybe when there is an acquisition (in this case you’d be migrating off of one to the other solution).